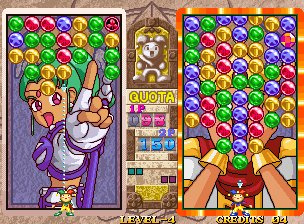 The lineup of retro offerings on Switch may largely be comprised of fighting games and shmups, but other genres feature too, such as platformers, sports titles and - in the case of Magical Drop III - a highly enjoyable puzzle games. 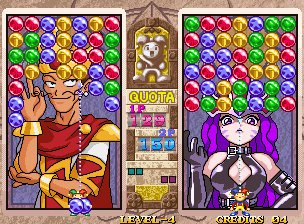 With the second game in the series already receiving the ACA Neo Geo treatment, it’s not a unique offering on the eShop, but there have been some additions to the already enjoyable balloon-popping action that makes this the better pick of the two. There are a few different modes of play in the game, but (as with previous instalments) all will see you focusing on re-positioning balloons into vertical lines; get three or more of the same colour and you eliminate them. 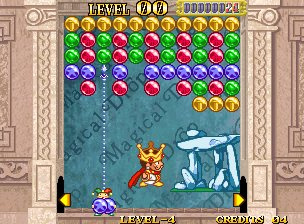 You move a jester along the bottom of the screen who is able to quickly pull down balloons then throw them to somewhere more useful. Though looking to make vertical lines, any balloons (of the same colour) connected to the line will also be removed. This can free the way for more balloons to connect and create further lines; these combos are a good way to quickly clear large spaces in the play-field and earn extra points to boot. New rows of balloons are regularly added, pushing the existing ones downwards; should the lower ones reach the bottom of the screen, you have failed. There are special blocks that - if included in your line - will remove all of that colour, while others will wipe out balloons in a certain direction. Of course, not all things onscreen are there to help and you’ll have to contend with bubbles (throw something at them to pop), ice blocks (only removed when adjacent to a line) and indestructible number blocks that require you to combo the indicated number of lines to remove. This sequel introduces a button to manually bring down the next row of balloons. This can be a good idea if it presents further chain opportunities, but it can also lead to humiliating defeat if you don’t find the colours you were hoping for. The presentation is superb with upbeat catchy music and bright, colourful visuals. There’s some characters to choose from in the game and (depending on the mode) these feature in the background as you play. Simple but effective animation is present, with characters reacting to the current situation. They look good too, with plenty of interesting character designs - although one is very fan-servicey, wearing just a ribbon and featuring more bounce than a Dead or Alive game. Challenge is the default mode upon starting a game and this has you battling against a series of CPU opponents. To win, you must reach the indicated quota of balloons before your opponent or simply survive for longer. After a gentle start, later opponents can be tough, but the usual (for Neo Geo) eight difficulty settings are available in the options menu to adjust the challenge as you see fit. There are also two in-game difficulty options and the Japanese version (a standard inclusion with these releases) features a third, as well as a bit of story setup and character endings; these comprise of black and white pencil drawings. Challenge is also available in two-player mode, and these matches can be frantic, fun affairs as you battle against a friend, desperately chucking balloons about and making lines and combos (sometimes by accident). The matches are best of three rounds, although a visit to the options menu can change this to a single round or increase up to an epic best of nine encounters. There’s a lot of replay value in the challenge mode, but this is true of Survival as well. This is the mode that makes use of the online leaderboards in the regular game as well as the Hi-Score (essentially the same, minus adjustable difficulty) and five-minute Caravan modes. Here, the on-screen play-field is expanded from a width of seven columns to nine, 11 or 13 and the aim is to score as highly as possible. Combos are key to rack up those points, while also ensuring your survival for that bit longer. Helping you to perform combos is the fact that (in this mode) your jester can walk off the edge of the screen and warp to the other side, and there is also a delay before lines are registered, enabling you to quickly reposition and keep the chain going. You’ll need fast reflexes, but you can quickly clear away large chunks of the on-screen balloons. Should you manage to completely clear the screen, you’ll be awarded a points bonus before the next rows start to descend. Trying to improve your score naturally becomes addictive. 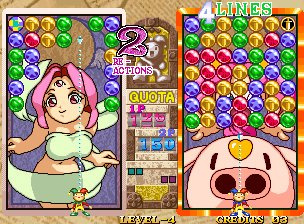 Those two modes already offer plenty of entertainment, but Magical Drop III throws in another one as well: Magical Journey. This one plays out like a board game, with spaces offering a mix of challenge and survival-like matches. 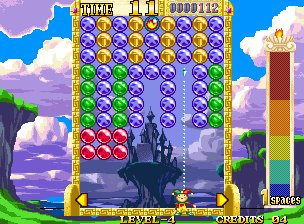 As well as the usual balloon-clearing action you need to collect flames as you play to determine how many spaces you can move forwards. There are branching paths at some points and some of the spaces you land on may advance you forward a bit, while others will send you backward. The mix of games you’re playing and the added focus on collecting flames makes for a varied play-through, but for extra entertainment you should boot up the Japanese version. Whereas the English version has you playing solo, the Japanese version has you competing against other (CPU-controlled) characters. Now not only must you reach the end of the board, but you must get there first as well. Something that can help achieve this is the way you can challenge the other characters to a match should you land on the same space; defeat them and they are eliminated from the game. 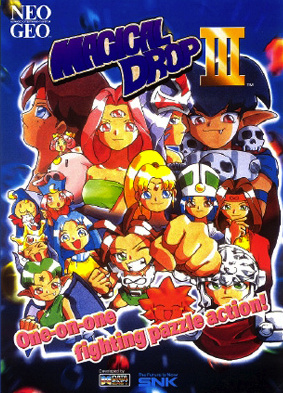 Simple to play, Magical Drop III is hugely entertaining as you frantically move about firing balloons to make lines or ideally set in motion a combo. Matches against the CPU or a friend can be tense affairs, with your balloons edging closer to the bottom of the screen. Alternatively, you can throw a balloon that starts a chain reaction that ends the match before anyone is entirely sure what just happened. Survival offers a different but equally enjoyable experience as you go about trying to improve your score to move up those online leaderboards. Magical Journey would be better if you could compete against human opposition, but it's still fun (particularly in its Japanese incarnation) and adds additional replay value to a game that already gives you ample reason to return many times over. Magical Drop III is an excellent choice for Switch-owning puzzle fans. Actually, i prefer the PS1 version for Special Mode. 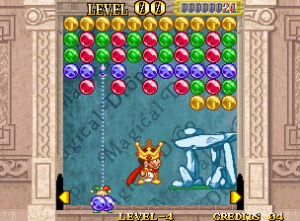 Special Mode has Frantic Gems (Bombs, Arrows, Bubble, Frozen gems) when you facing with Fortune (Final Boss) or you can activate during Versus Mode. I fancy the purple haired lady. Best thing about this game? Bouncing boobies. The sounds of this game is annoying. A 9 eh? I'll have to try it out. Another Neo Geo title in the bag. A great puzzle game by any standard and one of Data East's very best games. Fantastic that both 2 and 3 are on the Switch. 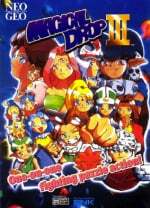 Bought so many Neo Geo games on Switch, but none of the Magical Drop games. I need to buy this and the 2nd game. Don't mind me, I'm just gonna magically drop my 8 bucks to this game. "Balloons"? Is that how everyone views the objects in Magical Drop? I always read them as marbles or jewels. They clack together, they're clearly made of some sort of stone or glass like material. I love Magical Drop 3, it's one of my all-time favorite puzzle games, but as I already bought 2, I'm not sure this is a priority to pick up. "Best thing about this game? Bouncing boobies." World & Empress, right ? This looks great and I plan to get it. But, there's another Data East game I'd LOVE to have on switch: Side Pocket (SNES). I wish they would bring that one out too. I can play it on my handheld SNES now (SupaBoy S), but I'd still buy it if it came out on switch! "The ribbon-wearing girl takes me back to early 2000s internet..."
Her name is World, based on Tarot card name. @Anti-Matter The World?! Is that why every time I saw her it felt like time stopped for a moment? World in Magical Drop is portrayed as Naked lady with Ribbon wrapped on her body and her 3rd eyes on her forehead. This game is ridiculously addictive. One of those "I'm just going to play for 5 minutes" games where several hours then disappear without you realising. Will definitely pick it up for Switch.